Frances Malpass, 21, from the Wirral, who graduated in Creative Studies and Media this week, was lucky enough to fly to LA earlier this year with fellow student Paco McGrory, to show their film at LifeFest Film Festival. Fran and Paco on their Graduation DayThe film, The Melancholy Nature of Magnetic Fields, written by Brian Stewart, was part of a Media Practice module and was the work of Fran, Paco, Nicola Hamon and Carys Drennan. About LA, Fran said: “It felt insane, a little overwhelming, I mean it was LA first of all, but we met a few people who were really warm and welcoming, it made us feel right at home, the festival was amazing, they had films being shown from all over the world, and it was a real eye opener to be able to see what other people's interpretations were of the issues a lot of people come across in life. It was incredible. We loved every second of it. “We were announced First Runner up in the Short Dramatics Category. We were already really excited to just be there, but to be announced second place felt like a massive bonus. 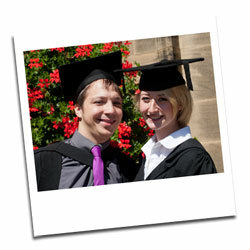 On her graduation day, Fran said: “It feels fantastic to be graduating! It's been something I think we've all been looking forward to since we started, and it's finally here! It's an amazing way to show how well you've done to the people who've got you through it all, and for everyone to feel awarded and proud. It's also a little sad it's the end of an era. Fran and Paco at the film festival in LA About her course, she said: “I was very unsure about University when I was applying during my A-Levels. I wanted somewhere not too daunting, and I wanted to be far away enough to say I've moved away from home, but close enough if I ever wanted to go back. I'd heard wonderful things and thought the location was beautiful, I was too unsure to be specific about which area of media I wanted to specialise in, so when I read about the Creative Studies course being flexible and that it would allow me to experiment throughout my time doing it, I felt it was perfect. “During my time at Bangor I was a member of The Photography Society and BEDS Theatre Society. I loved doing photography as it gave me a chance to handle the cameras and start using my imagination, I fell in love with it, and this then proceeded to my tireless enthusiasm for filming. will be going out to schools as an educational piece. They also have plans for another film written by Paco, and possibly another written by Brian Stewart once again. About the future, she added: “Right now it's to get these films up and running, advertised and shown. Judging by what was achieved with the first one, who knows what could happen?! But other than that I'm not too sure, I'm still finding my feet. If there's one thing university has taught me, it’s to throw yourself into what you enjoy. If you're dedicated to something you're passionate about, you'll surprise yourself with the results.